Fresh off his 2013 Grammy nomination for Best Latin Jazz, Manuel Valera is setting up for another chance at the music industry honor. 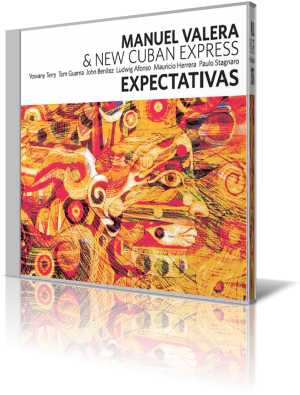 With his band, New Cuban Express, Valera releases Expectativas (Mavo Records, 2013). Valera plays piano, Fender Rhodes and synths. New Cuban Express members are Yosvany Terry, alto and soprano saxophones and chekere; Tom Guarna, electric and acoustic guitar; John Benitez, electric bass; Ludwig Afonso, drums; Paulo Stagnaro, percussion on all but two tracks; Mauricio Herrera, batas on “Isabelita” and percussion on two songs. Special guest Manuel Valera Sr. plays alto saxophone on “La Gloria Eres Tu,” the album’s lone cover song. The title song is upbeat but has an ambient quality. Terry leads much of the way with the soprano sax, at times paired with Guarna’s electric guitar. Though starkly Latin jazz, this piece has a symphonic element about it. Whatever instrument is out front, one can’t not be aware of the bass, drums and percussion. Listen for Afonso’s toms and cymbals regardless of what else is going on. Valera takes point about mid-song. After his solo, the band engages in a call and response with Afonso and Stagnaro answering the calls of the others. “Chennai Express (for S.A.M. )” is another high-energy song. It’s dedicated to Valera’s friends at the Swarnabhoomi Academy of Music in India, where he taught for seven weeks at the beginning of 2013. The time signature is 11/4. To say there’s a lot going on is an understatement. Highlights are the orchestral maneuverings of all the notes, Benitze’s thick bass lines and Guarna’s electric guitar. Tight syncopation counts for a lot as well. Manual Valera and New Cuban Express is a project that’s deeply influenced by the experiments of the Cuban artists from the 1970s and ’80s. Like those before them, this ensemble mixes elements of jazz, R&B, fusion and funk with Cuban music styles. Valera composed 11 of the 12 tracks.